Not so many years ago, radiology groups saw teleradiology companies solely as a tool to help radiologists get a good night’s sleep and to supplement radiology coverage in underserved areas. Few people predicted trouble when PACS and the Internet begat teleradiology. 1. A hospital does not currently have a radiology group providing services and has not had a radiology group servicing it for some reasonable period of time. 2. A hospital is serviced by a radiology group and that radiology group invites NightHawk or a PMO to enter into a hospital service agreement with the group. 3. A hospital initiates an open competition to consider changing the radiology group servicing it. NightHawk would then consider supporting a PMO if neither the incumbent radiology group nor any competing radiology group is a NightHawk customer. NightHawk says it serves approximately 1,600 facilities with its digital network that represents 26% of hospitals in the United States. It clearly wants radiology groups to view the company as an ally, not an adversary. "Over the past year, many teleradiology providers have chosen to take the easy route to revenue, competing with radiology groups and threatening the viability of the traditional radiology group model," NightHawk President and CEO Dave Engert said via a company press release. "We have heard from the radiology community that there is an opportunity to help radiology groups improve their services to their hospital customers without being predatory or competing with these groups. We learned a hard lesson last year when we became involved in a process that inadvertently produced a difficult and unfortunate result. Although our contractual involvement was indirect, NightHawk is committed to eliminating the potential for any undesirable outcomes to be repeated in the future." PACS and teleradiology have transformed the way radiology services can be delivered. 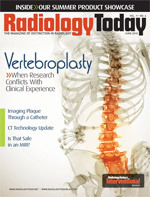 Radiology groups, hospitals, and management companies continue to explore ways they each can use teleradiology to their benefit—sometimes at the expense of other imaging players. Radiology groups can use teleradiology coverage to increase their capacity, allowing the group to pursue new contracts at the expense of other groups. Hospitals can use teleradiology as leverage against radiology groups or as a transitional step toward bringing radiologists in house as hospital employees. Radiology management organizations can use teleradiology the same way traditional groups do. At the same time, teleradiology companies are deciding how they will permit their services to be used in this increasingly competitive environment. In a phone interview with Radiology Today, Engert reiterated that NightHawk’s objective is to provide services that help radiology groups succeed, not compete with them. He also pointed out that NightHawk was under contract with Imaging Advantage when it contracted with Mercy Health and “couldn’t just pack up and leave” without disrupting radiology services to the hospitals and the patients they served. By moving forward with its publicized rules of engagement, NightHawk says it is telling radiologists how it will conduct its business with hospitals and PMOs. Engert called it a clear guideline on where it will—and will not—pursue business. He is fully aware the radiology community is watching. “All we can do is say what we’re going to do and then do it and then see how it plays out,” Engert told Radiology Today.